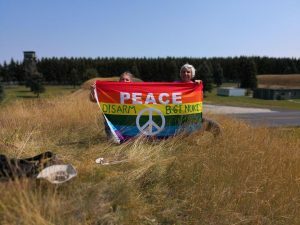 Peace and disarmament activists from Belgium, France, Germany, Italy, Kazakhstan, the Netherlands, New Zealand, Spain, Russia, the United Kingdom and the United States gathered at the Büchel airforce base in Germany this weekend, to protest the U.S. nuclear weapons deployed at the base and at other NATO countries, and to call on nuclar-armed States to end the nuclear arms race, and start a process to prohibit and eliminate nuclear weapons. 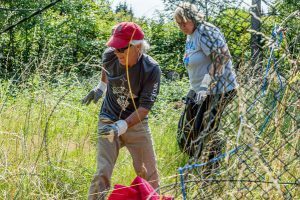 The international peace action camp at Büchel started on July 10, just before the recent NATO Summit, and finishes two days after the July 16 Helsinki Summit of Presidents Trump and Putin. A principle target of the protest is the controversial practice of placing US nuclear weapons known as B61s in other countries, and US plans to replace the current bombs with new ones. Under a program called “nuclear sharing” Germany, Italy, Belgium, Turkey, and The Netherlands still deploy a total of 150 Cold War-era US gravity H-bombs. The governments admit to nuclear sharing agreements, but will not confirm the numbers or locations of nuclear weapons on their territories. Critics point out that all five countries are parties to the Nuclear Non-Proliferation Treaty (NPT) which explicitly prohibits nuclear weapons from being transferred to or accepted from others. 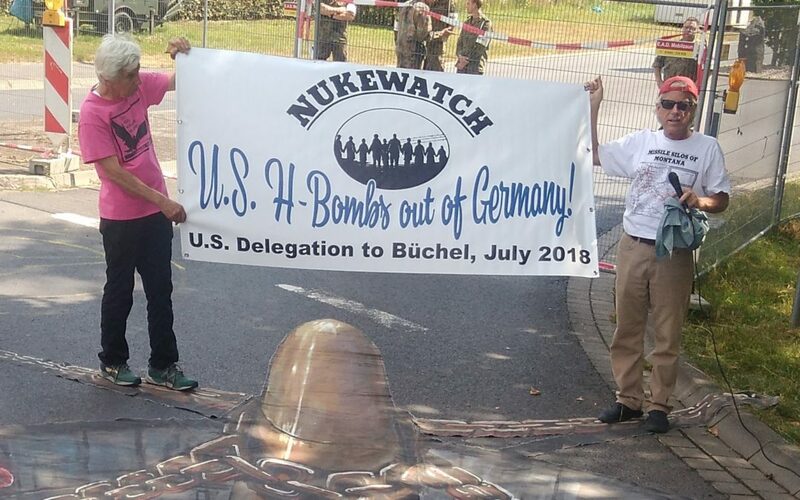 On July 11, the Parliamentary Assembly of the Organisation for Security and Cooperation and Cooperation in Europe approved the Berlin Declaration which endorses the call for nuclear-armed States to adopt policies never to initiate a nuclear war (‘no-first-use’ policies) and to adopt other disarmament and confidence-building measures. The declaration also calls on OSCE governments to affirm and achieve the goal of a nuclear-weapon-free world.